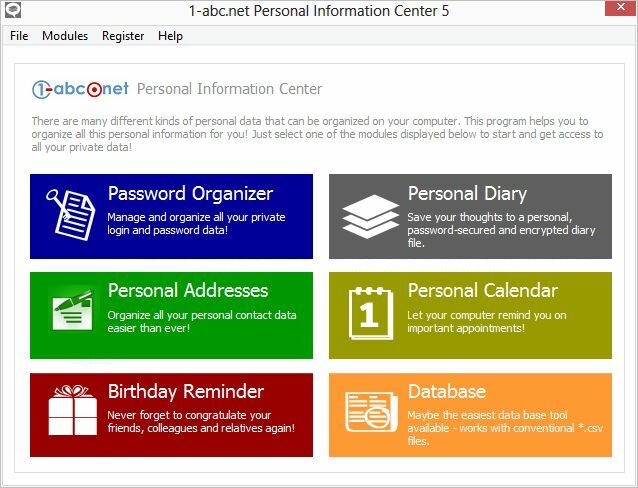 1-abc.net Personal Information Center - Organize all your personal and private data easily and secure! Many kinds of personal data can be organized on your computer. This program includes all features for creating and saving password data, private diary entries, birthday data, calendar entries, databases and personal addresses in one easy to use software suite. Instead of using different products that offer solutions to any single task discover how easy it can be to get access to all your personal data from just one program. Let us be honest: Do we not all forget important dates and appointments from time to time? Meeting friends, doctor’s appointments, visit relatives, sports training, birthdays, weddings … there are so many things to organize and it is not always easy to keep best overview. With the Personal Calendar module you can organize as many appointments as you wish, and your computer will show you a reminding message automatically. Finally, the Database module is your perfect tool to organize any kind of data just as fast and easy as possible! Add some columns and name them as a base for your data, of course you can always add and remove columns later. Working with conventional *.csv files. *.txt and *.sqlite export features - prepare your secure data for printing, sending by e-mail or whatever you want.